Do yourself a favor and wait. Putah Creek was bumped up from 80CFS to 100CFS a few days ago and I, along with many other anglers, took the bait. The creek looks great but the fishing wasn't too good. The combination of heavy angling pressure along with the fish not being spread out makes the creek a tough place to fish. I fished on a weekday which I was hoping would have less pressure however there were at least three or more cars parked in every access and an angler in every one of the few fishy spots. 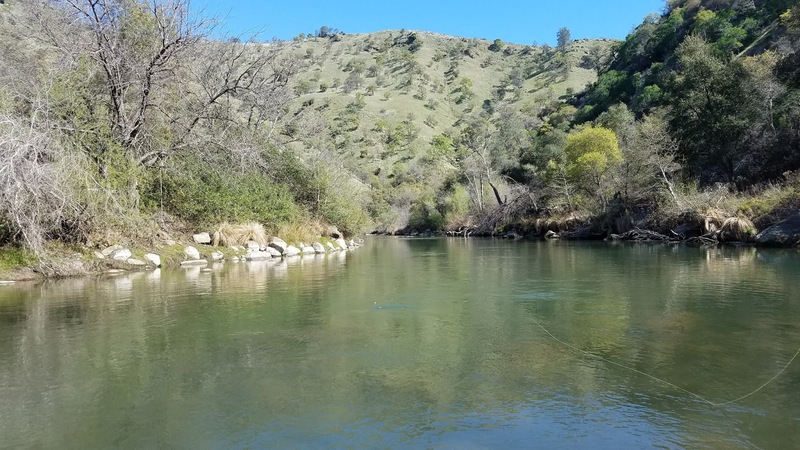 Minimal flows means that the fish will be stacked up in the deepest runs and pools below well-known riffles; this essentially means that the early angler who gets first pick of these deeper areas will catch a lot of fish. The positive side of low flows is that you can easily cover water and eventually hook something if you're persistent enough. Try the pocket water, nooks-and-crannies, everything in-between, and be prepared to lose a lot of flies. If I were to go back out there I would try fishing a small streamer instead of nymphs. There were too many nymph anglers out there with "rootitis" that made covering water by nymphing very frustrating. The creek is pretty much a stillwater at these flows anyway might as well strip some streamers. Let's hope we get 200CFS soon before the weather warms and I'm out fishing for bass and bluegill instead of trout.